Posh boss Grant McCann watches the action at AFC Wimbledon. Photo: Joe Dent/theposh.com. Peterborough United manager Grant McCann admitted he was ‘hugely disappointed’ to have dropped points in today’s (November 12) League One game at AFC Wimbledon. Posh drew 2-2 at Kingsmeadow after conceding a first-minute goal and another on the stroke of half time. In between Danny Lloyd and a Marcus Maddison penalty had edged Posh in front. Danny Lloyd of Posh points to the sky after scoring the equalising goal at AFC Wimbledon. Photo: Joe Dent/theposh.com. Lloyd, who was making his first Football League start, won the Sky TV man-of-the-match award. 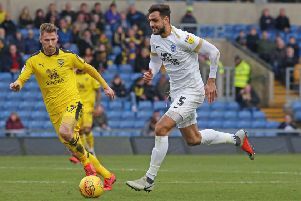 Posh missed second-half chances to win the game, but Marcus Maddison marred a fine individual display when he was cautioned for a piece of simulation late in the game, an incident McCann said he missed. Posh moved up a place to eighth with their point. They are next in action in an FA Cup first round replay at Tranmere on Wednesday (November 15) before returning to League One action at home to Blackpool next Saturday (November 18). “I’m hugely disappointed not to have won the game,” McCann stated. “We were average in the first-half, but managed to get our noses in front before conceding a very bad goal on the stroke of half time,” McCann stated. “But we were far superior in the second half. We created some great chances when Gwion Edwards and Jack Marriott should have scored. “Marcus Maddison was outstanding. I didn’t see what happened towards the end as there were a lot of bodies about, but whatever happened won’t change the fact we are lucky to have Marcus. “He’s added another goal and an assist and he could have had even better figures. His delivery from wide areas was outstanding. “It just wouldn’t go in for us today. Gwion slipping over when he was through summed it up. “In the first half we played too slowly and lacked a ruthless streak. But we were in front when we conceded the sort of goal that should never have happened. It was one huge punt forward which caught our back three in bad positions.